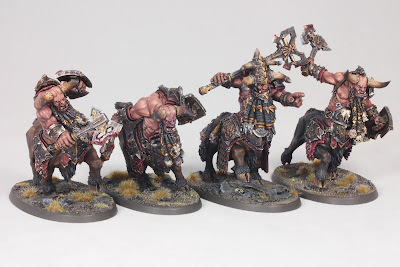 Today's Mini of the Week is actually a unit, but what a great unit it is. Besides just being fantastic sculpts from Forge World, the level of painting on these is superb. I love the ruddy skin tones for them, something we don't see very often, but makes perfect sense for guys who hang around fire loving Duardin all the time. The color choices are great as well, with a very realistic and desaturated look to it, while still maintaining an' Eavy Metal feel to them. Everything is smooth and crisp. I particularly like the faces with the great stubble effect around their mouths and the subtle color changes around the eyes, nose, and lip. The horns are very nice as well with a well done transition from light to dark. I don't know what else I can pick out here since it's all done to the same high level. That's another thing that's particularly impressive, that the same quality of painting was maintained across the whole unit. This a lovely unit and I would love to see a whole Chaos Dwarf army from him. 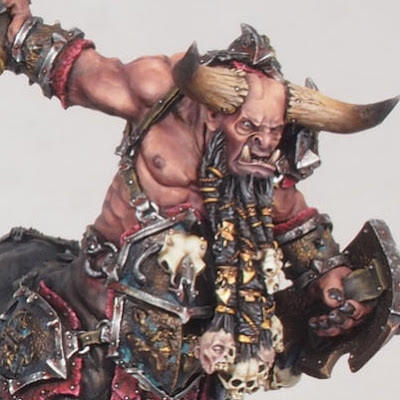 They have several other Chaos fantasy units on his Cool Mini or Not account which are worth checking out too. I almost picked their Slaughterbrute instead.